﻿ PreNeed Trust Services for Funeral Homes | Compliance | Funeral Services, Inc. When your sales program is powered by FSI, you're always in compliance. Laws and regulations, both at the state and federal level, change. FSI stays on top of them. 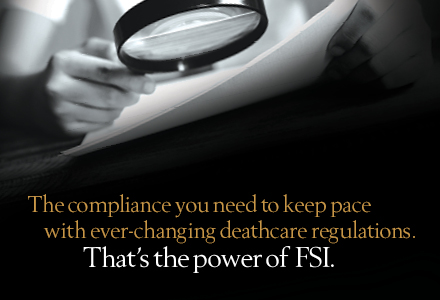 With FSI on your team, regulatory audits of your preneed sales program or perpetual care trust go more smoothly. How? We are compliant with SSAE-18, Type II - a stringent standard created by the American Institute of CPAs. In addition, when you are audited or examined by your regulator, FSI provides any necessary assistance to ensure the regulator receives the information it needs so you can continue business as usual.